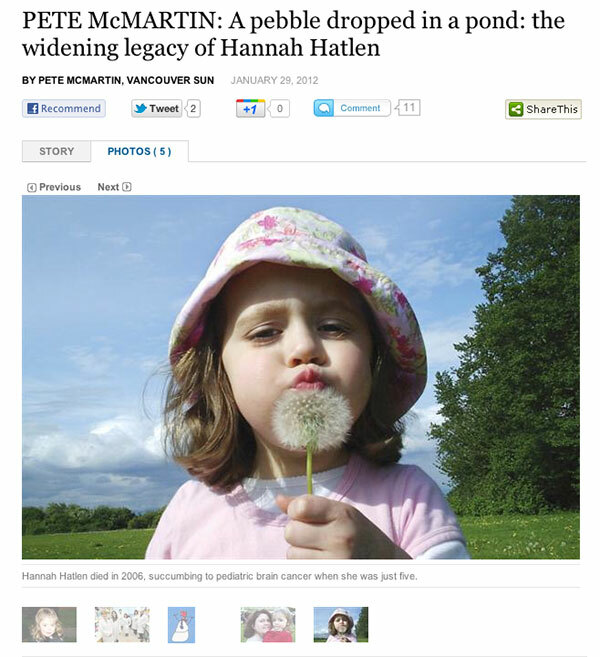 Hannah's Heroes has been featured in various media for our work. Dr. Sandra Dunn’s Masters students, Mary Pambid and Joanna Triscott who currently holds a Hannah’s Heroes Fellowship have been awarded the Mitacs-Accerlerate Internship. Their project titled “Targeting the RSK Axis to Eliminate Medulloblastoma” and “Retrospective Molecular Subtyping of Pediatric Medulloblastomas and the Evaluation of BTIC Gene Signature in Tumors with Poor Prognosis” respectively, have been approved for a one year grant of $30,000, with MITACS providing one-half of the funding towards their fellowships and the remaining balance contributed by Hannah’s Heroes Foundation. MITACS is a national research network hosted by the University of British Columbia which brings together researchers from the academia, industry and the public sector to accelerate research in a wide variety of fields. Having read Dr. Dunn’s article (“A pebble dropped in a pond: the widening legacy of Hannah Hatlen”) in the Vancouver Sun, MITACS contacted Dr. Dunn and encouraged her graduate students to submit a project proposal for the Mitacs-Accerlerate Internship Program. Now with the funding support by MITACS and Hannah’s Heroes Foundation, Dr. Dunn, Mary, and Joanna will be using this fellowship money to further their research in finding a cure for pediatric brain tumours.